The tiny wool puffs are similar to down feathers in the sense that you can move the filling around to be any shape you desire. 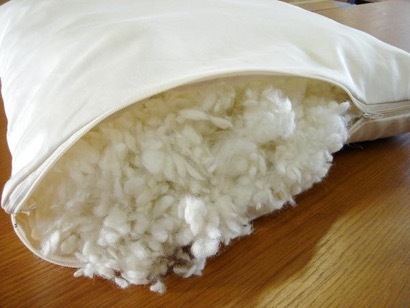 Meet our most popular & versatile pillow: The Woolly "Down" Bed Pillow. The tiny wool puffs are similar to down feathers in the sense that you can move the filling around to be any shape you desire. The wool puffs have more substance than down and can take a shape and hold it...until you want it to move it around to a different shape.This pillow won't compress as much as regular wool batting pillows tend to do, plus it is easier to wash and care for than our other wool products. Bonus!We designed this with a zippered cover for added versatility. With it you can easily add more puffs or take some out if it is too thick.This is a medium-filled pillow. If you like a thicker pillow, we sell bags of additional puffs available in 3 and 6 ounce increments to customers who purchase this pillow or have in the past. Simply unzip & and add it in.